Getting to work on the New York Subway. The New York Subway is one of the largest subway systems in the world, with trains departing from stations about every 2-5 minutes during rush hour and about every 5-15 minutes during the rest of the day. The Subway is a cheap and convenient way to get around New York City, however traveling on the Subway during rush hour can be also daunting, lots of pushing and shoving, impatient people all trying to get to work at the same time. 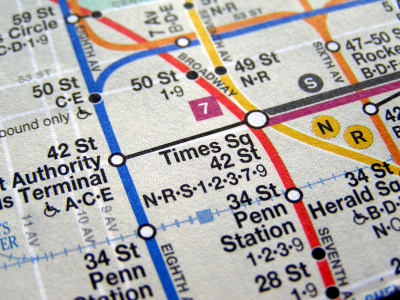 We have put together some helpful tips on riding the Subway and ways to minimise risks. Position yourself on the platform where the doors of the Subway car open. Let passengers disembark before trying to get into the Subway car. Not only is this polite it makes room for more people to get on. It’s not rocket science. Remove your backpack if you are wearing one and carry it. If there is one seat empty, check to see if there is a good reason why! This also goes for an empty Subway car, especially during the rush hour. Carry an anti-bacterial hand cleanser with you. Ensure that you get on the correct service, for instance don’t get on the express train if you actually need the local train. Keep your wallet in your front pocket or at the bottom of your bag.